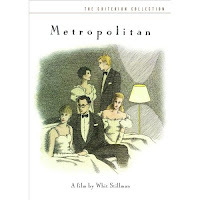 If F. Scott Fitzgerald was an independent film director, his first film would probably have been fairly similar to Metropolitan, the debut of writer/director Whit Stillman. Nominated for an Academy Award for its witty, sophisticated screenplay, the film is the opposite of the 80’s brat pack films. Instead of dealing with the animosity of blue verses white collar with the good hearted underdogs most often seen in the works of John Hughes coming out victorious, Stillman celebrates, pokes fun at and analyzes yuppies in this no-holds-barred look at the privileged and beautiful group that one character named Charlie Black (Taylor Nichols) describes as the UHB, which stands for Urban Haute Bourgeoisie. Feeling that this acronym is (as he claims) more sociologically precise than the word preppy, Charlie is just one of many articulate characters that spend their evenings going to black tie events and parties during Christmas break. One evening, Tom Townsend (Edward Clements) finds himself in the right place at the right time while catching a cab and is instantly befriended by one of the group’s leaders, Nick Smith (Christopher Eigeman) to join him at an after-party. Once Tom falls in with the crowd, the film begins to reveal itself as not a simple protracted plot structured piece of the wealthy but instead as a character driven, highly literary, intimate and richly drawn study of the UHB. Newcomer Carolyn Farina--who was accidentally discovered by the director’s wife while working in the Macy’s perfume department (IMDB) where she was swept up much in the same way that Tom Townsend is in the film-- gives a memorable performance as Audrey, the surprisingly sheltered and fragile girl who falls for the less than wealthy Tom. While my first introduction to the world of Stillman was with Barcelona, also starring the highly verbal Nichols and Eigeman (who’s since become one of my favorite under-used actors popping up for fine turns in shows such as the Gilmore Girls), Metropolitan, which earned the director the Best First Feature award at the Independent Spirit Award is just as compelling and entertaining today as it was during its initial release, given the ultimate digital transfer treatment with a Criterion Collection DVD release. A festival favorite, Gatsby fans will find themselves instantly hooked (and noting some similarities to the work including Fitzgerald homages much more in depth than just characters named Tom and Nick) and it’s also a good work to go back and view today in the wake of filmmaker Wes Anderson, who may have been somewhat inspired by the verbal, self-involved, and quirky character pieces created by Stillman.